Venture upstairs for a night at Lola above Butchertown Grocery, to join IDEAS xLab for a dynamic night where a fusion of artistic genres, talents, culinary traditions, and beverages await! Entertainment will feature a mix of performances and poetry by Cheyenne Mize, Hannah Drake, Tonya Abeln, Robin G., Theo Edmonds, Josh Miller, Joey Thieman and the Shades of Ebony, along with a few surprise guests! Guests will enjoy a sampling of Caribbean-influenced cuisine crafted by Chef/Owner Bobby Benjamin, and tickets include drink tickets for 2 of our signature alcohol infused or zero-proof beverages by Nic Christiansen. "A great community, just like a great dish, consists of a healthy variety of ingredients, flavors, and cultural influences," said Chef Benjamin. "My team and I are extremely excited about the opportunity to work with IDEAS xLab to further their vision of creating a healthier community through innovative cultural engagements." 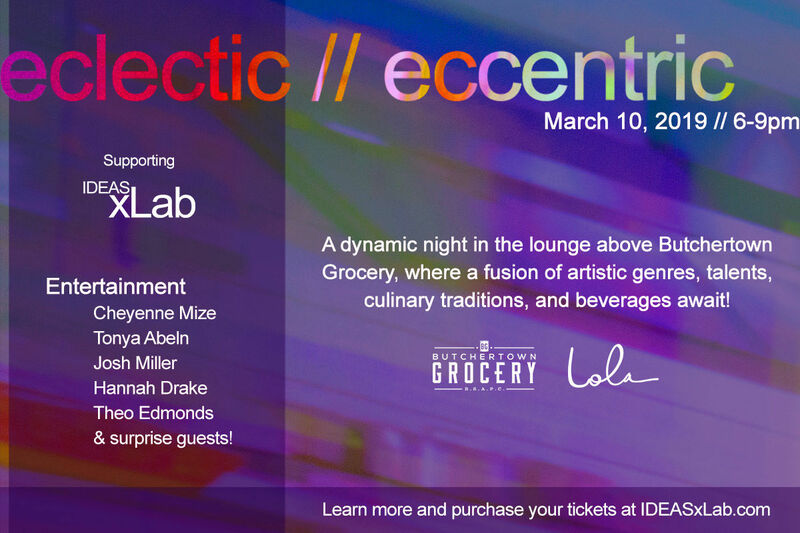 Proceeds from eclectic // eccentric ticket sales will benefit IDEAS xLab, a Louisville-based nonprofit focused on leveraging the power of community creativity and culture to transform people’s lives. Doors open at 6pm, welcome at 6:30pm with performances to follow until 9pm. Visit IDEASxLab.com to learn more about our work!